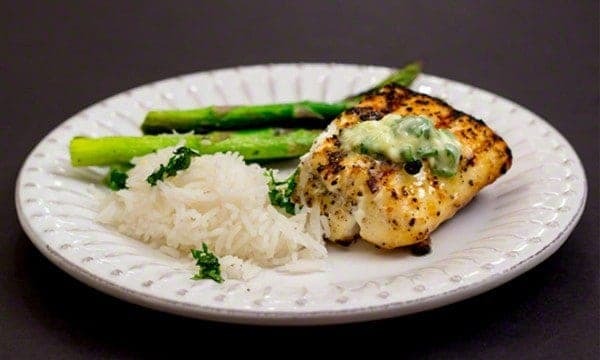 Grilled Halibut with Cilantro-Lime Compound Butter. This compound butter is great with almost any kind of fish. It’s one of those go-to recipes to have in your head. If you’re one of those cooks who likes to make stuff in advance, this next piece of information will delight you. Chefs who make compound butters very often make them in advance, using softened butter and minced herbs, aromatics (like garlic or shallots) and seasonings. I’ve seen recipes where you make it in a larger batch, and then roll it up in a log, wrapped in plastic wrap, and freeze it. Then you can pull it out of the freezer for any meal for which you’d like to use it, and slice off however many medallion sized portions you need, to flavor proteins. I’ve used compound butters on beef and pork, but have discovered that one of the very best ways to use it is on fish. The recipe I’m sharing with you today is particularly perfect for fish. It adds moistness to the fish, along with bright (the lime zest and lime juice) and savory (the garlic) flavors. I use it not only on halibut, but any fish I’m grilling. I’ve never found a compound butter that I like better for fish, than this particular recipe. Don’t feel like you have to limit your use of compound butters to proteins, though. I also serve rice as an accompaniment to grilled fish, and usually add a blop of the butter to the top of the rice, as well. Why not? I believe in spreading the love around! To grill the halibut we used in the picture, we simply brushed it lightly with olive oil, and seasoned it generously with salt and pepper. How long it stays on the grill depends on the thickness of the fish. Halibut can dry out easily, so my husband aimed for cooking it medium-rare. His aim was true, as you can see by the color on the exterior of the fish. Grill it till the fish flakes easily, which might run 4-5 minutes per side, depending on the hotness of your fire, and the thickness of your fish. If you’re allergic to cilantro, as my friend is, or if you are one of those folks who just taste soap, I recommend substituting parsley, or perhaps even some parsley and fresh mint would be nice. I declare, I could eat this every night! 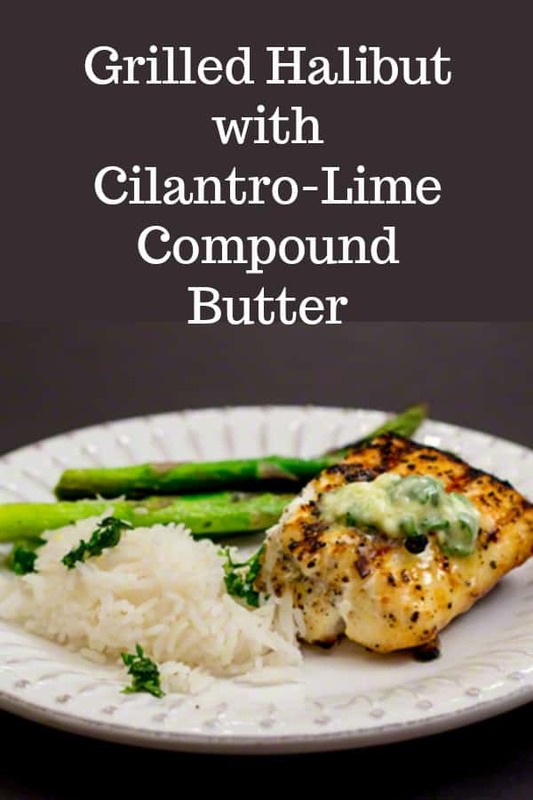 A delicious compound butter that moistens and brightens up the flavor of fish immeasurably. This is worth saving and keeping for any time you have fish. Almost ANY kind of fish! In a small bowl, combine all ingredients. Serve a dollop of this atop each portion of fish. I often serve rice as an accompaniment to grilled fish, and a pat of this melted on the rice is also delicious! Interested in other recipes I use to prepare fish? I have some stellar salmon recipes that might interest you. Here’s my go-to recipe for when we’re NOT grilling: Pistachio Crusted Salmon. And this one is our newest family favorite: Wild Salmon with Charred Green Onion and Walnut Sauce. I think you’ll be thrilled with any one of them. Please be sure to share this recipe on social media, as a favor to me, wherever you interact with your friends. Thanks, so much!